In previous ODCs we had the artists in residency presenting some of their previous work, we heard that work through the voices of CNC researchers and we had researchers presenting discussion subjects they found interesting to share. 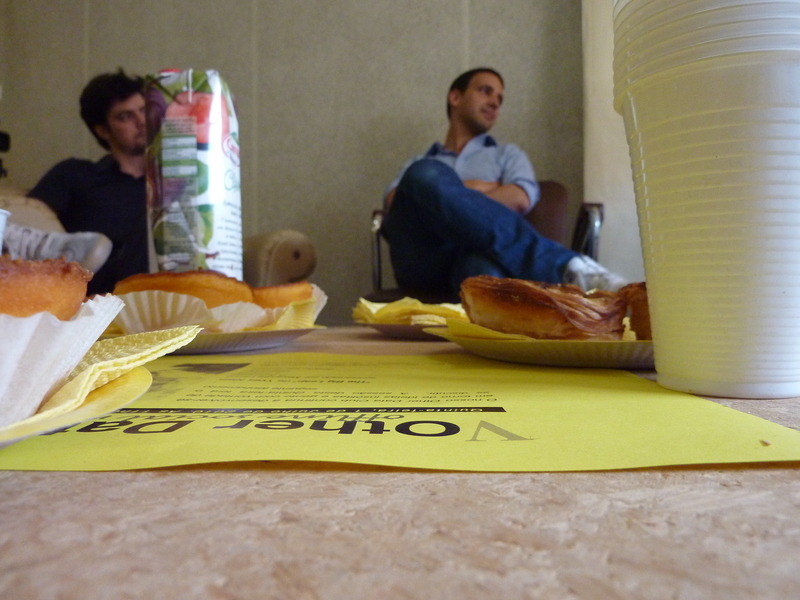 In yesterday’s ODC we had two presentations: one (“A small step”) from a researcher, Raquel, who outlined her path since she was born to this moment when she’s about to defend her PhD Thesis; the other (“The big leap”) from one of the artists, Alexandre, who talked about one of his favourite works of art, the “Saut dans le vide” from Yves Klein. It was very interesting for me to establish connections between the two universes described by them, one scientific, the other artistic. At a given time Alexandre stated that one of the things that made Klein so special was the fact of him being an artist without context, of difficult catalogation at the time given the innovating charateristics of his work. In my mind I associated this idea to the previous discussion we had about Raquel’s presentation when we spoke about different types of research work: on one hand the kind of work a researcher does when he/she starts working already existing data on a previously defined direction (defined, for instance, by the research group you’re in); on the other hand the work when you start a given research from scratch. I associated (in a very losely manner) this latter type of work to the possibly innovating characteristics of an artwork. Another association my brain did was when we talked about the importance for the value of an artwork of being unique. This came to discussion after Alexandre mentioned there were several versions of that photomontage from Klein. This made me think about the importance of priority in science – being the first to publish on a given subject. Teresa also added the possibility (more like a fact, sometimes) of the same scientific paper being published twice (in different magazines). Which is not a very nice thing to do, they say. Scientific researchers are commonly valued by the number of papers they publish, most specially when they are the first author. And in the art world? Are you valued by the number of works of art you create? What does a particular ODC looks and sounds like? We’ve been posting pics, but nothing like some images moving. If you can recall, Ciência Viva TV attended one of our previous Other Data Clubs (ODC). Well, now they have published online the whole recording of that session. Here it is. Feel free to take some peeks, here and there. 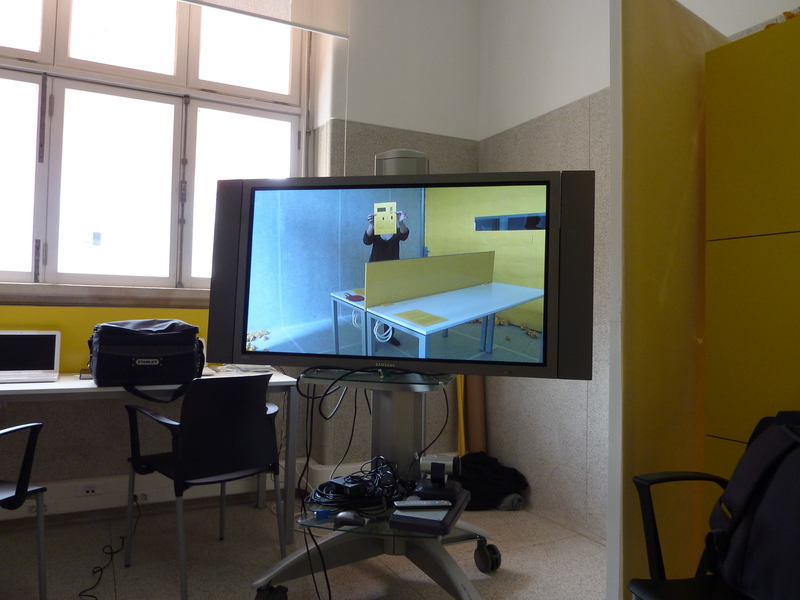 The yellow room has glass walls so whoever uses the corridor can watch what we’ve been recording during our stay. This Other Data Club had something different. 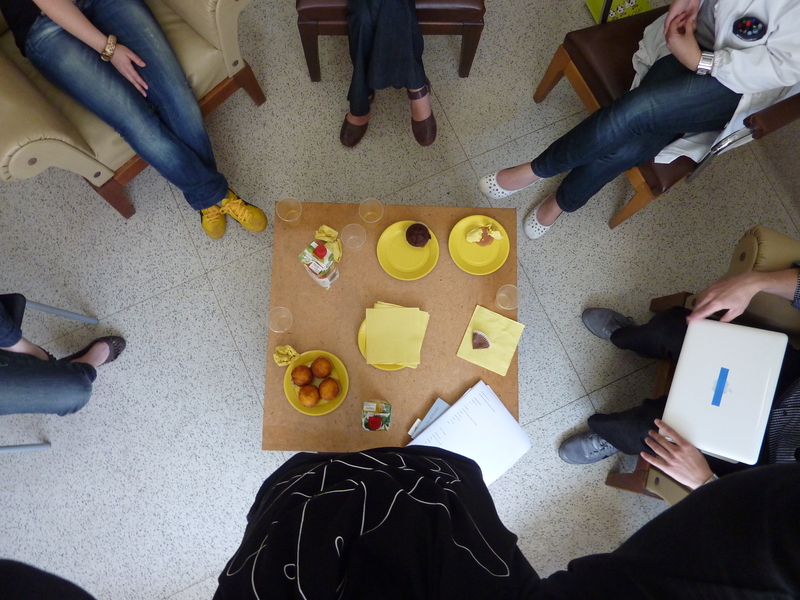 We, the artists in residency, didn’t present a thing. The discussion was provoked by the interventions of two CNC researchers who brought to the ODC some subjects they found interesting to be shared and talked about. Gabriel brought an article by Peter Duesberg (among others) entitled “The chemical bases of the various AIDS epidemics: recreational drugs, anti-viral chemotherapy and malnutrition” where the authors explore the possibility of different causes for AIDS. What Gabriel finds interesting in the first place is that this scientist is a nice example of someone who doesn’t stop to question things even when everybody else thinks differently. After this first discussion, Teresa read us an excerpt of “A Discourse on the Sciences“, by Boaventura de Sousa Santos, namely the section entitled “All scientific knowledge aims at becoming common sense.”. His ideas on that brief excerpt made us talk about common sense and “scientific” sense, science communication, and even lead to someone’s reflection about the need for democracy inside scientific labs. 1 p.m. was there and we had to leave. 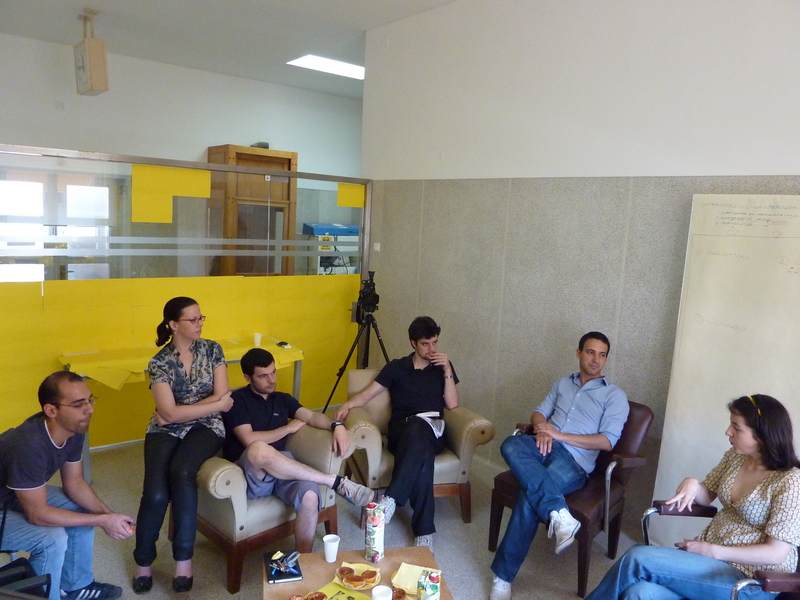 It was really interesting to have researchers lead the subjects of the conversation which tend, very often, and judging also by the experience of previous ODC’s, to the social structure of the scientific lab (and of science as a system) and the essential interference this has on the research being carried on. And if this subject is so important to them – the scientific researchers – it definitely is important to us – the artists. 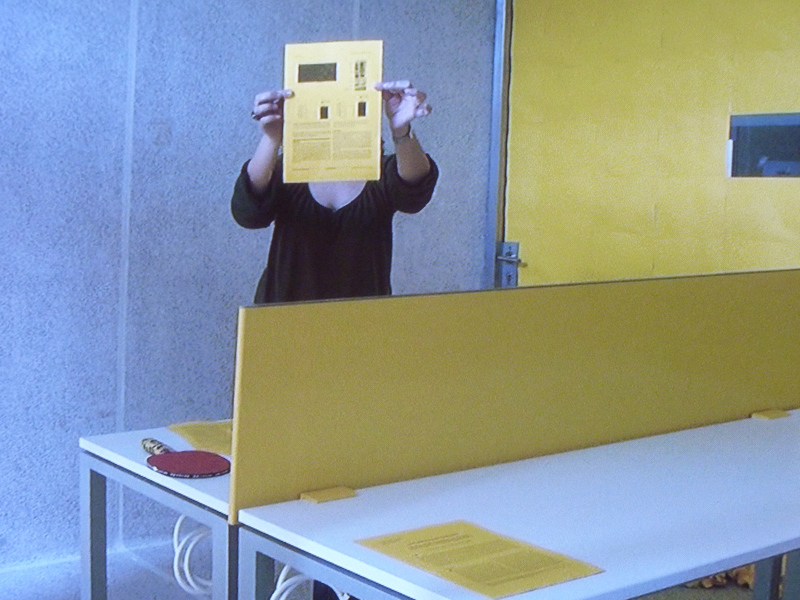 The other day, when I got to the yellow room at CNC someone was there already. A man and a woman were mounting something big. This was quite a surprise. I went to that girl standing at the door for a cup of coffee. When I got back they were still there, mounting. It was no easy task, definitely. By the time of my second visit one could already have a pretty good guess about what was being built there. It was a big yellow wall with 18 doors and 36 keys (2 for each door). It was a place to keep things safe, a safe place, 18 safe places! And so I felt secure. It’s interesting, one of the things we’ve being consciously promoting during our stay at the research center is the interference with its daily routines. We aim to interfere and, who knows, make a tiny little difference, trigger new paths. And now we were surprised by an exterior interference. Aha! The yellow room has been evolving from the distant time when it was called “the aquarium” to the way it was before the new yellow wall. 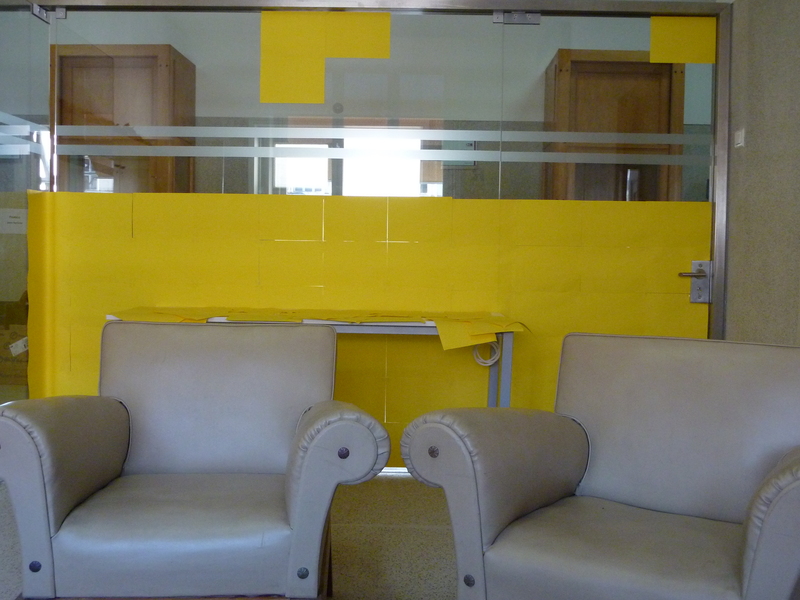 But now, this exterior interference made us adapt to a new context inside our yellow domains. And so we did. And it, most certainly, made us take new paths on the roads of our imagination, that’s just the way our brain works. 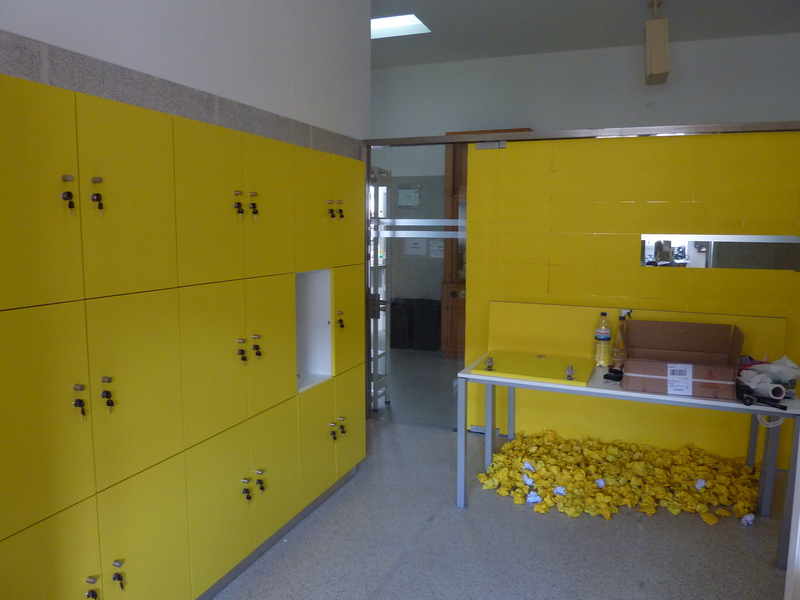 In case you’re wondering why that yellow wall suddenly appeared the reason is simple: those lockers were bought some time ago (before we were here, at the centre) and they were finally delivered. And were meant for that specific place, so they had to be placed there. 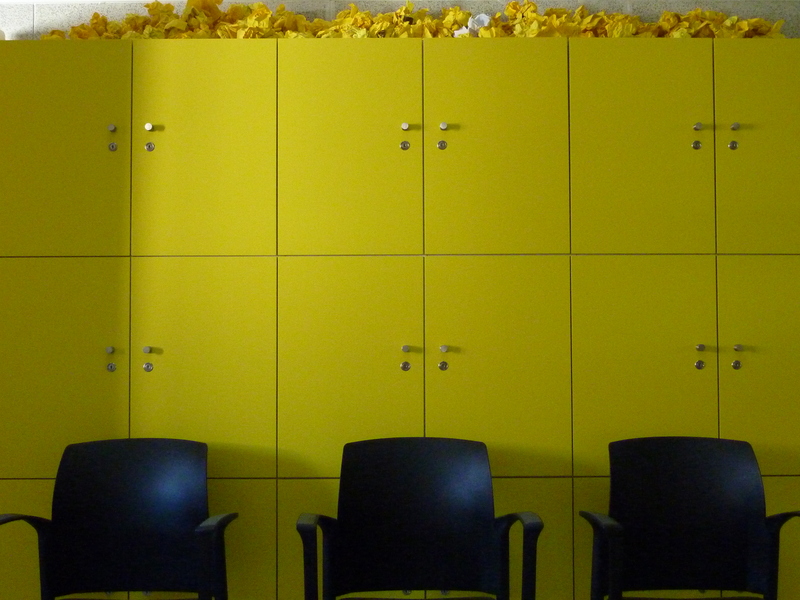 Now we have a most spacious room with a new yellow wall and 18 doors, 17 closed and 1 with the keys (we now can keep some of our stuff in one of the lockers – try and guess which). But the most interesting is that this redesigning of the place wasn’t triggered by us, it was triggered by the centre. Will we manage to do something similar with our stay here? Appetizers: we had excerpts of LED – inner voyage in a computer, namely a conversation between an electron and the processor and the RAM of a computer and, later, the electron talking with a transistor. 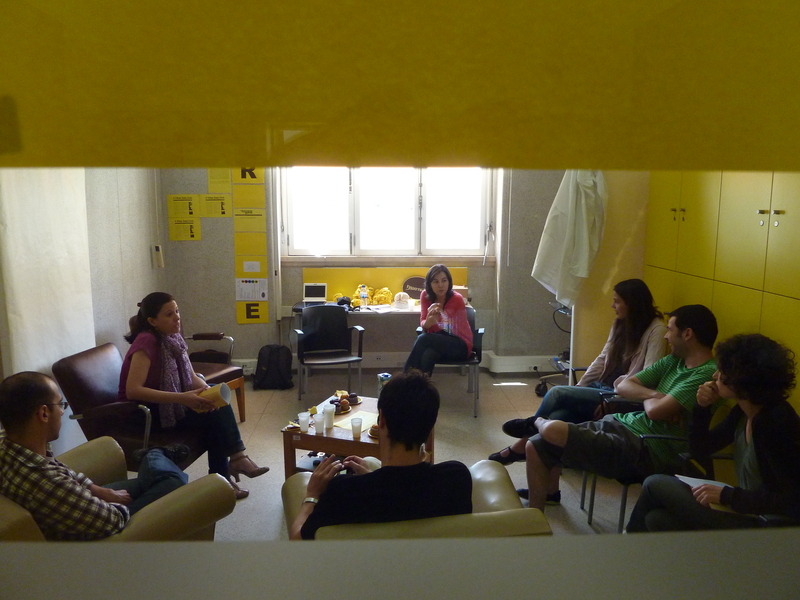 Salads: we discussed science communication, the general (un)interest of people in science from the personal experiences of the researchers, the barrier that scientific language and terms pose to the communication of science. Daily soup: we also digested science financing in Portugal and the eventual bad distribution of these resources. Main course: we started exploring the Cyborg Manifesto by Donna Haraway.